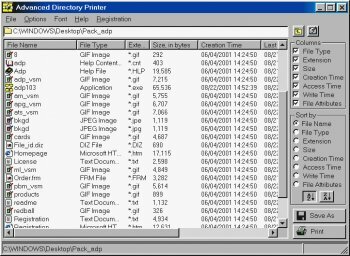 Advanced Directory Printer is designed to print or export a list of directories, sudirectories and files. Information fields include file name, type, extension, size, creation time/date,last access date, last write time/date, and file attributes. You can choose which fields to print or export. It allows you to sort the list of directories, sudirectories and files by any information fields. File and folder listings can be saved as text file or as file ready for import into main spreadsheet or database programs.